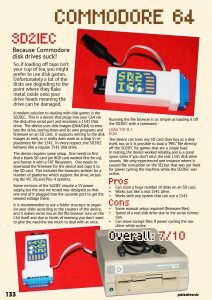 HomeCommodoreRetro Reviews: Commodore 64 accessories! Loading tape games on a C64 can be a hassle. Assuming you can find a working datasette for the system, the chances are that a lot of tapes have degraded to the point of being unusable, particularly in the heat of Australia. A lot of these games have been preserved online by people as tape images, but loading them onto an original machine can be tricky. A number of years ago, we actually wrote an Android app called TapDancer, which aimed to provide an audio signal generated from these files which could then be fed into a datasette, by using a car cassette to CD adapter. This worked, but it depended a lot on the head alignment of the datasette, the adapter and a number of other factors. When it worked, it worked and when it didn’t it didn’t. In comes the uCassette. 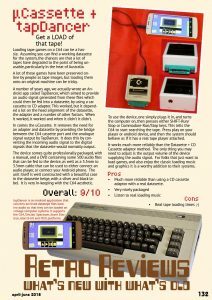 It removes the need for an adapter and datasette by providing the bridge between the C64 cassette port and the analogue signal output by TapDancer. It does this by converting the incoming audio signal to the digital signals that the datasette would normally output. The device somes quite professionally packaged, with a manual, and a DVD containing some 500 audio files that can be fed to the device, as well as a 3.5mm to 3.5mm cable that can be used to either connect an audio player, or connect your Android phone. The unit itself is well constructed with a beautiful case in the datasette beige, with a silver and black label. It is very in-keeping with the C64 aesthetic. To use the device, one simply plugs it in, and turns the computer on, then presses either SHIFT-Run/Stop or Commodore-Run/Stop keys. This tells the C64 to start searching the tape. Press play on your player or android device, and then the system should behave as if it has a real tape player attached. It works much more reliably than the Datasette + CD Cassette adaptor method. The only thing you may need to adjust is the output volume of the device supplying the audio signal. For folks that just want to load games, and also enjoy the classic loading music and graphics it is a worthy addition to their systems. Much more reliable than using a CD cassette adaptor with a real datasette. So, if loading off tape isn’t your cup of tea, you might prefer to use disk games. Unfortunately a lot of the disks are degrading to the point where they flake metal oxide onto your drive heads meaning the drive can be damaged. A modern solution to dealing with disk games is the SD2IEC. This is a device that plugs into your C64 via the disk drive serial port and emulates a 1541 Disk drive. The device uses disk images (D64/G64) to emulate the drive, storing them and its own programs and firmware on an SD card. It supports writing to the disk images as well, so it really does work as a drop in replacement for the 1541. In every respect, the SD2IEC behaves like a regular 1541 disk drive. The device requires some setup. One needs to first find a blank SD card (an 8GB card worked fine for us), and format it with a FAT filesystem. One needs to download the firmware for the device and copy it to the SD card. This includes file browsers written for a number of platforms which support the drive, including the VIC 20, and Plus 4 systems. Some versions of the Sd2IEC require a 5V power supply, but the one we tested was designed so that one end of it plugged into the cassette port to get the needed voltage there. It is recommended to use a folder structure to organise your disks according to the creators of the device, and it makes sense too, as the file browser runs on the C64 itself and due to limits of memory, you don’t want to give the machine too much to deal with at once. The device can treat any SD card directory as a disk itself, too so it is possible to load a “PRG” file directly off the SD2IEC for games that are a single load. space saver if you don’t miss the real 1541 disk drive sounds. We only experienced one instance where it caused file corruption on the SD, but that was our fault for power cycling the machine while the SD2IEC was active. Can store a huge number of disks on an SD card. Works just like a real 1541 drive. Works with any system that can use a 1541. Speed of a real disk drive due to the serial connection. Can leave corrupt files if power cycling the machine while active. Gaming is more fun when it is shared, and although the C64 has two joystick ports, there are times when even two players isn’t enough. In that situation, the 4 Player interface comes to the rescue, providing an extra two 9 pin joystick connectors to the C64. The interface plugs into the User Port on the C64, and then provided the software supports it, it is possible to read a second pair of joysticks. It’s a very easy way to get more people in on games that support it, provided you can find enough working joysticks! So, what titles are supported by the 4 Player interface? 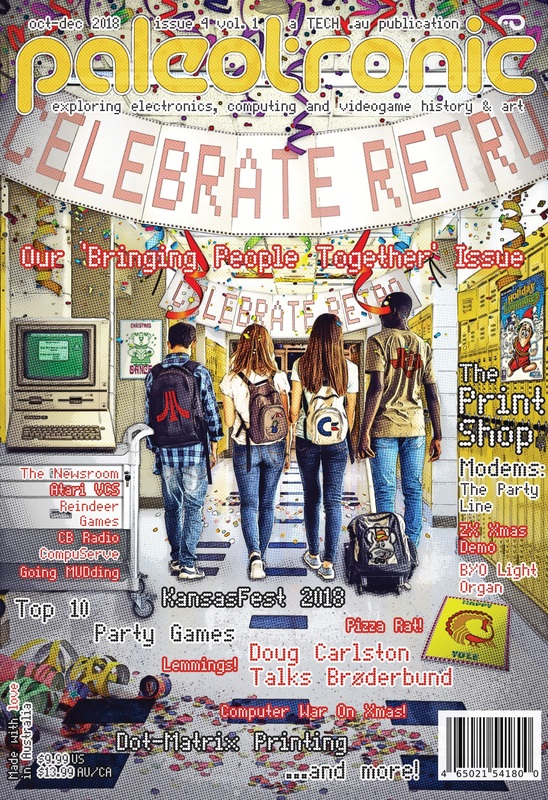 Currently there are about 20 titles available, some new games, some remakes of classic multiplayer games from other platforms (bomberman anyone? 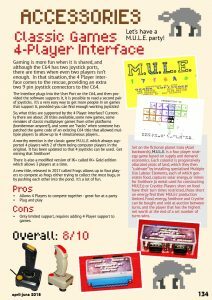 ), and some are “hacks” when someone has patched the game code of an existing C64 title that allowed multiple players to allow up to 4 simultaneous players..
A worthy mention is the classic game M.U.L.E. which always supported 4 players with 2 of them being computer players in the original. It has been updated so that 4 joysticks can be used. Get mining that Smithore! There is also a modified version of IK+ called IK+ Gold edition which allows 3 players at a time. A new title, released in 2017 called Frogs allows up to four players to compete as frogs either trying to collect the most bugs, or by pushing each other into the pond. It’s a lot of fun. Only limited support, requires adding 4 Player support to games.